If your readers are constantly using technology in their day to life, this PLR pack will be perfect for you. As more people use electronic devices for longer periods of time, “tech neck” has become more widespread. It is the neck pain and numbness and tingling in the fingers that occur after using a smartphone or computer for an extended period of time. At one time it was a condition experienced by solely by computer programmers and coders. Most people experience symptoms like soreness or stiffness of the neck and shoulders at the end of the day and don’t view it as a problem, mainly because the soreness or stiffness doesn’t happen every day. The problem is that these symptoms can, and do, get worse over time. If you experience a sore neck, headache, or get numbness and tingling of the fingers every day, you should not ignore these symptoms of “tech neck”. The worst case scenario is that these symptoms will progress to you losing strength in your fingers and hands. Inform your readers about the warning signs and dangers of Tech Neck and how they can prevent it from happening to them. Share the articles on your blog, use them in your newsletter, or compile them into a fresh new lead magnet. Then promote the content using the included emails and social media posts. Are You Suffering From Tech Neck Headaches? 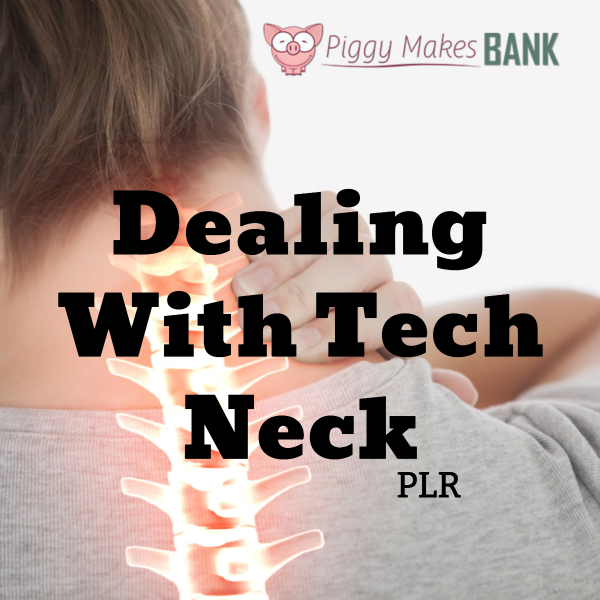 Help your readers learn more about Dealing With Tech Neck. They'll thank you for it! Get this incredibly value-packed PLR pack for only $27. That’s way less than you’d pay a quality ghostwriter to write just one article for you. Give your readers the content they are looking for!